In collaboration with Dr. Avelina Espinosa, a biologist at Roger Williams University, US, we have postulated that the controversy over evolution-and-science versus creationism is inherent to the incompatibility between scientific rationalism/empiricism and the belief in supernatural causation. The ‘incompatibility hypothesis’ (IH) helps us explain the everlasting antagonism in the relationship between science/evolution and religion. Our latest study is titled ‘Acceptance of Evolution by America’s Educators of Prospective Teachers,’ to which the New England Science Public Series Evolution –where the work was just published— has added the subheading ‘The Disturbing Reality of Evolution Illiteracy at Colleges and Universities.’ In it, we rely on IH to test the cultural-pollution effects of religiosity on acceptance of evolution by America’s finest education scholars; that is, university professors specialized in training future teachers. Previous reports about public acceptance of evolution in the US (around 40%, a rate distant from the top countries’ 80%, like Ireland, Denmark, Sweden, France or Japan) have examined the role of religiosity in the rejection of evolution; but only few studies have characterized the influence of religion on evolution’s endorsement by elite educators. It has been assumed that higher-education faculty remain distant from belief-based explanations of natural phenomena; a supposition that Dr. Espinosa and I suspected to be false. We studied attitudes toward evolution among 495 educators of prospective teachers affiliated with 281 colleges and universities distributed in 4 regions and 50 states in the US. These professionals (87% PhD or doctorate holders) where polled in five areas: (1) their views about evolution, creationism and Intelligent Design, (2) their understanding of how science and the evolutionary process work, (3) their position about the hypothetical ‘harmony or compatibility’ between science/evolution and supernatural causation, (4) their awareness of the age of the Earth, its moon, our solar system and the universe, and the application of the concept of evolution to the cosmos, and (5) their personal convictions concerning the evolution and/or creation of humans in the context of the responders’ religiosity. ‘Acceptance of evolution openly’ and ‘thinking that evolution is definitely true’ among educators of prospective teachers in the United States (center). For comparison, New England college students (left) and research faculty (right) are depicted; both have the highest national levels of acceptance of evolution among students and university professors, respectively. • 59% of the educators accepted evolution openly, 51% thought that evolution is definitely true, and 59% admitted to be religious. • 94% of the New England researchers accepted evolution openly, 82% thought that evolution is definitely true, and 29% admitted to be religious. • 63% of the New England Students accepted evolution openly, 58% thought that evolution is definitely true, and 37% admitted to be religious (Figure above). • The educators’ rejection of evolution increased, conspicuously, with increasing level of religiosity. 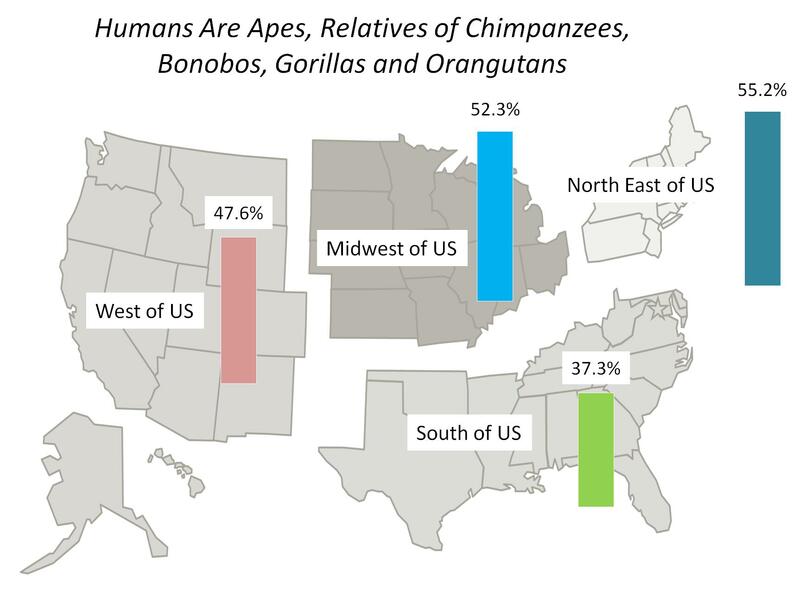 One of the significant results of the study: only 37.3% to 55.2% of educators of prospective teachers knew (or accepted) that humans are apes, relatives of chimpanzees, bonobos, gorillas and orangutans. 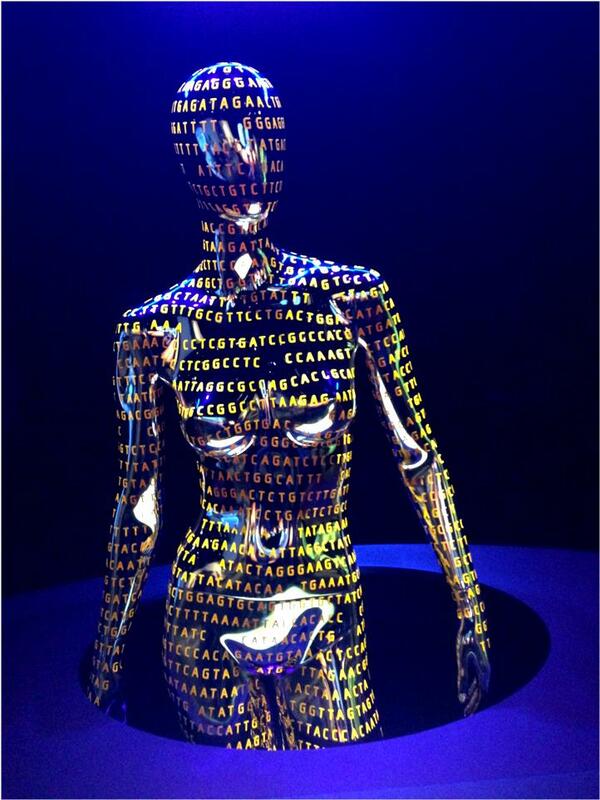 Our research has led us to conclude that harmonious coexistence between science/evolution and religion is illusory. If co-persisting in the future, the relationship between science and religion will fluctuate between moderate and intense antagonism. — © 2014 by Guillermo Paz-y-Miño-C. all rights reserved. Note: The complete 92-page study is available open access at New England Science Public; it includes 23 figures, statistics, 34 maps, 12 tables, and a companion slide show ‘Image Resources’ for science journalists, researchers and educators. NESP Series Evolution Vol. 2 No. 1 was released on September 15, 2014, in celebration of Captain Robert FitzRoy’s arrival in the Galapagos on September 15, 1835; at that time, the young naturalist Charles Darwin was FitzRoy’s distinguished guest on board of the HMS Beagle. Reference: Paz-y-Miño-C, G. & Espinosa A. 2014. Acceptance of Evolution by America’s Educators of Prospective Teachers. 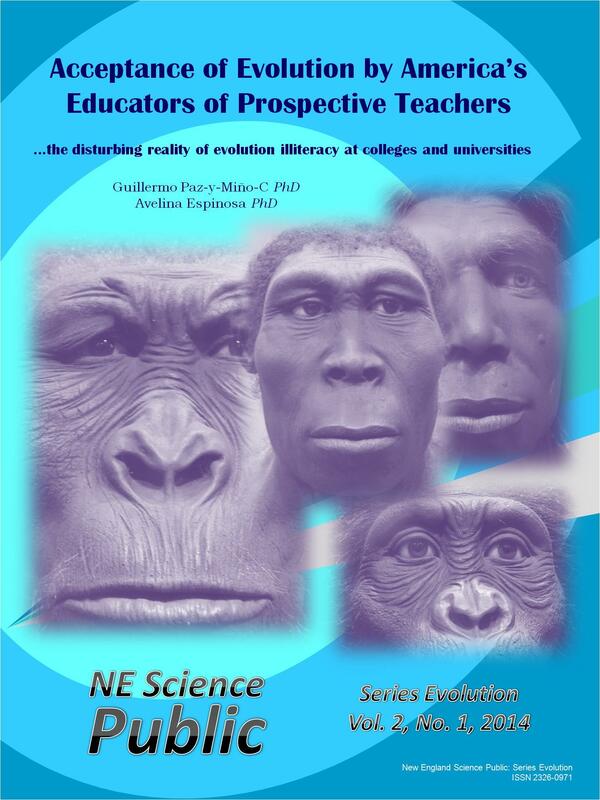 New England Science Public: Series Evolution 2(1): 1-92. [PDF] and supplementary ‘Image Resources’. I have previously stated that to be reassured that evolution is true one simply needs to visit the New Bedford Whaling Museum. Its displays of skeletons of a North Atlantic right whale with a calf, a humpback, a juvenile blue, and a sperm whale can impress anyone curious to compare human bones to those of cetaceans. And such comparison suffices to infer that common ancestry connects mammalian sea gallopers — whales and dolphins — to us, the upright bipedal apes who live in cities and launch vessels to explore the stars. My addiction to the splendid North American science museums — antidotes to the impostors “Genesis Park” or “Creation Museum” — will remain pleasurably incurable. 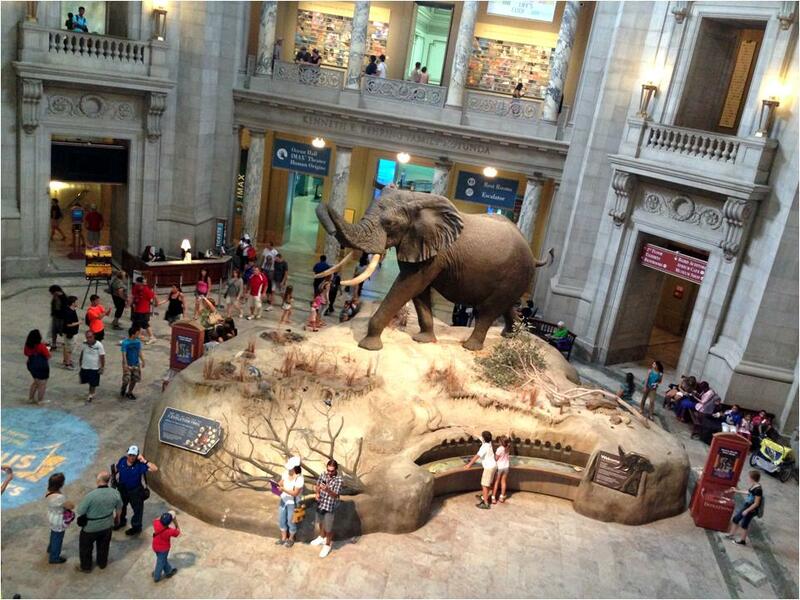 But a latest visit to the Smithsonian National Museum of Natural History, in Washington, D.C., was certainly unique. It started while hiking among 540-million-year-old trilobite fossils, at the Burgess Shale deposit in the Canadian Rockies. What used to be the bottom of the sea is, nowadays, layers of flaked rock at 6,900 feet elevation, evidence that Earth’s crust moves and shapes the imposing mountains. In 1909, Charles D. Walcott, paleontologist and secretary of the Smithsonian Institution, discovered the first fossils of the Burgess Shale. He later brought to the National Museum of Natural History 65,000 specimens, mostly collected at Fossil Ridge, which runs from the Wapta Mountain to Mount Field, in British Columbia. 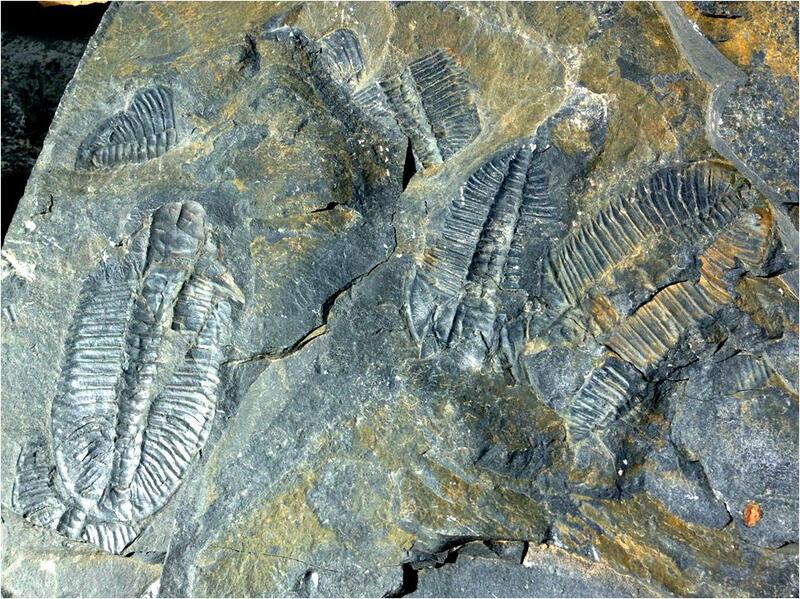 When alive during the Cambrian, the now fossilized Burgess Shale organisms anchored themselves to the sea floor, some were sessile, or dwellers on the muddy substrate, a few swam freely. Sponges, plenty of algae and arthropods like trilobites, or chordates like Pikaia (a tiny elongated and laterally flattened fish-shaped swimmer, related to modern vertebrates) enriched the biodiversity of the oceans. The most appealing to me are the trilobites and the predator Anomalocaris. To envision the complexity of the Cambrian ecology, one must immerse the imagination into the ways of the archaic ocean or, perhaps, enlarge all creatures 12 times their original size and gather people to watch them. 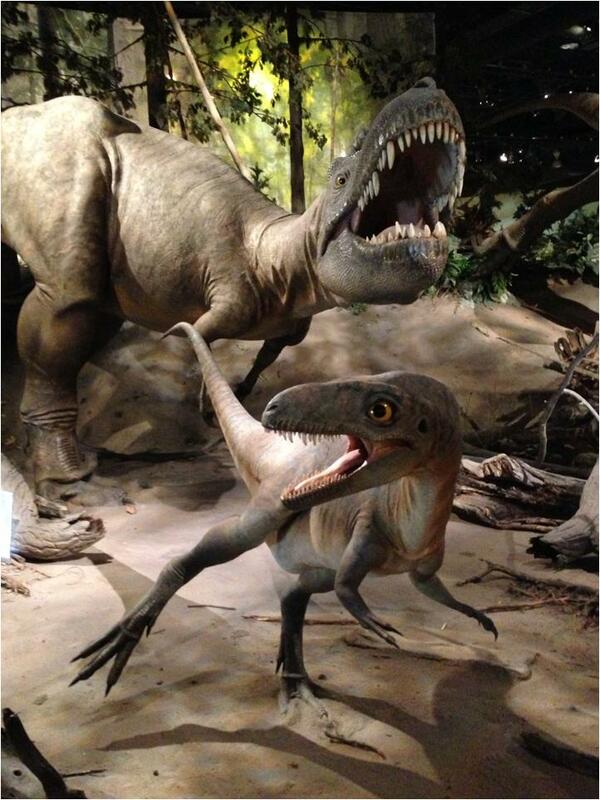 The latter is precisely what the Royal Tyrrell Museum of Alberta — the second stop in my journey — has done. 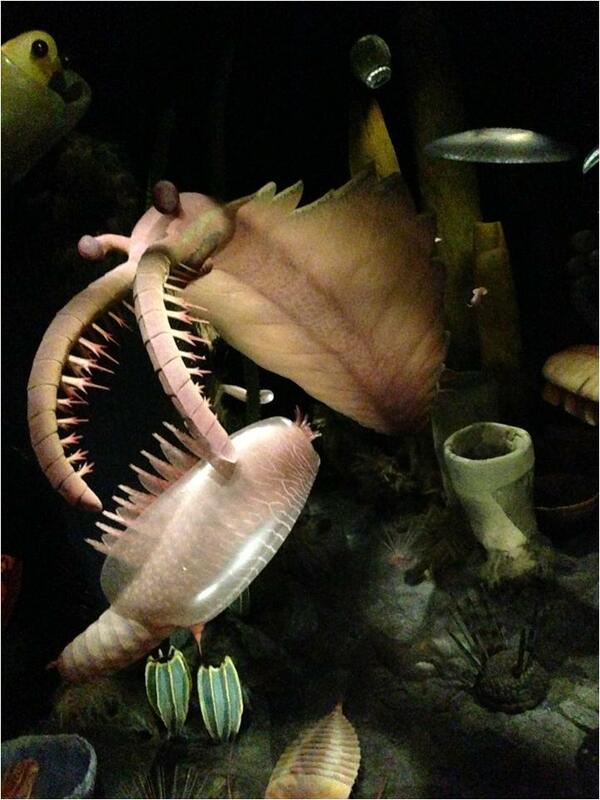 A well conceived exhibit helps visitors understand the relevance of the Burgess Shale fossils. The adventure began in the dark. Spotlights shepherd our eyes to the colorful sponges Vauxia, Takakkawia and Pirania, which cohabited with green algae in an apparently serene environment. The cute trilobites, with their large-cockroach pretense and curled sensory antennae resembling groomed whiskers, emerged while the audience pointed at them with excitement as the lights brightened, thus bringing our sight onto additional life forms, like mollusks, sea cucumbers or velvet worms. This tranquility was interrupted by the sudden illumination of a 3-foot Anomalocaris (actual dimension of the “abnormal shrimp”). This segmented animal, distantly related to today’s arthropods, swam by undulating lateral flaps along its body. With huge eyes on stalks and two arched gripping appendages with spikes, one on each side of the mouth, Anomalocaris predated upon soft-shelled organisms and, arguably, on the armored trilobites. The Burgess Shale exhibit was, however, just a warm up for what the Royal Tyrrell Museum had to offer: after the Cambrian interpretation dome, a world class display of more than 40 mounted dinosaurs and large mammals followed; a saturation of fauna, from the Triassic, 230 million years ago, to the Pleistocene, 2 million years ago. The museum’s most prominent specimens were the Late Cretaceous Albertosaurus — earlier relatives of Tyrannosaurus rex — discovered by Joseph B. Tyrrell in 1884. These “Alberta Lizards” were endemic to the region and ruled the top-predator occupation 70 million years ago. In its entirety, the Royal Tyrrell Museum of Alberta is a celebration of the 3.5-billion-year history of life on Earth, an elegant showcase of the evidence for evolution. But the Smithsonian National Museum of Natural History — the last stop in my journey — has brought technology and modernity into two contrasting new exhibits: “Genome, Unlocking Life’s Code,” an interactive touch-screen experience about how research in genetics benefits citizens and humanity, and “Q?RIUS,” a hands-on access to real specimens in the Smithsonian collection. Both exhibits are exemplars of effective informal education. I looked for Q?RIUS eagerly while walking through ancient whale skeletons, hanging from the ceiling, and a diorama of Cetacean evolution: Basilosaurus (35-40 million years ago), Maiacetus (40-49 million years ago), Dorudon (36-38 million years ago), and Llanocetus (34-38 million years ago), which looks comparable to the baleen whales displayed at our New Bedford Whaling Museum. 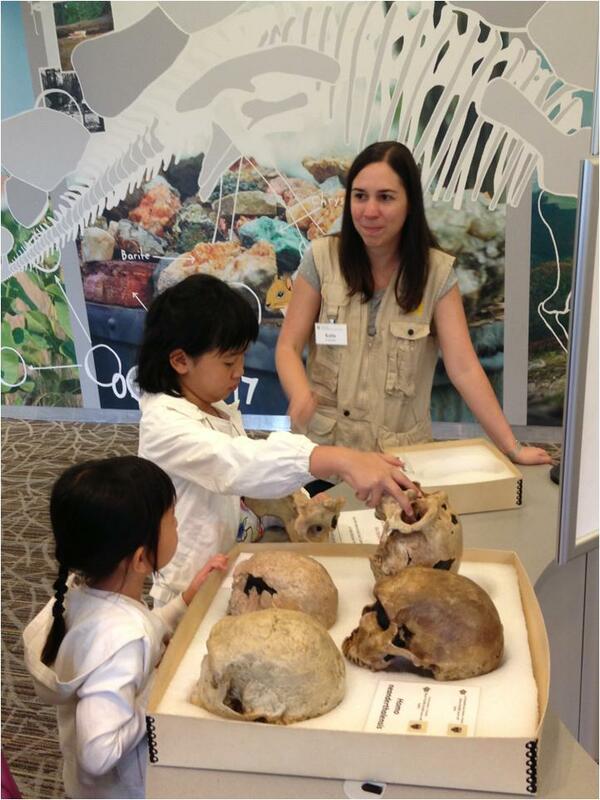 Q?RIUS is about “Early Youth Engagement through Science;” the visitor acts as curator, protector of Nature’s treasures. Thus Q?RIUS empowers our youth’s innate curiosity to seek and value the truth. And there is no more powerful scientific truth than evolution. — © 2014 by Guillermo Paz-y-Miño-C. all rights reserved.